Biodynamic farming aims to become self-sufficient in compost, manures and animal feeds. Biodynamics is a holistic, ecological, and ethical approach to farming, gardening, food and nutrition. Biodynamic agriculture has been practiced for nearly a century, on every continent on Earth. Biodynamic principles and practices are based on the spiritual insights and practical suggestions of Dr. Rudolf Steiner, and have been developed through the collaboration of many farmers and researchers since the early 1920's. Today, the biodynamic movement encompasses thousands of regenerative gardens, farms, ranches, orchards, and vineyards, in a wide variety of climates, ecological contexts, and economic settings. Most biodynamic initiatives seek to embody triple bottom line approaches (ecological, social and economic sustainability), taking inspiration from Steiner’s insights into social and economic life as well as agriculture. 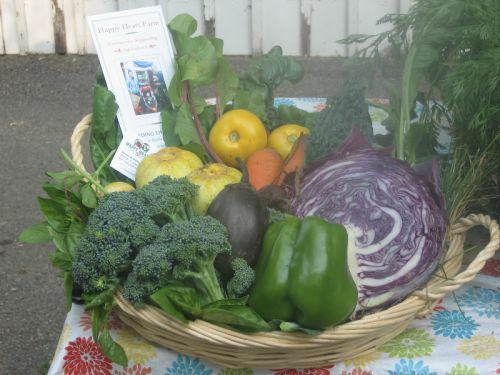 Community supported agriculture (CSA), for example, was pioneered by biodynamic farmers, and many biodynamic practitioners work in creative partnerships with other farms and with schools, medical and wellness facilities, restaurants, hotels, homes for social therapy and other organizations. Biodynamics is thus not just a holistic agricultural system but also a potent movement for new thinking and practices in all aspects of life connected to food and agriculture. Biodynamic agriculture is a means of healing the earth and the human being; it enlivens the soil and thereby the food we eat. This is achieved through various cultural practices, but is centered on the deeply personal relationship between the farmer and the farm. Although the Biodynamic Movement originated slightly before the Organic Movement, it actually represents the next conscious step beyond what the Organic Movement brings to agriculture. Fundamentally, it is inclusive of many of the methods familiar to "organic" and "permacultural" practitioners, but also takes into account the planetary influences and spiritual forces that affect plant growth. The use of the "biodynamic preparations" (specialized composts that are applied in homeopathic doses) also sets biodynamics apart from other farming practices. It follows that nutritious food can only grow in nutrient rich soils. A large scale study reported by researchers in the UK in 2007 found that organically grown vegetables had between 20 and 40% higher levels of vitamins than those grown using artificial means; this was the case for antioxidant vitamins seen in tomatoes, potatoes, cabbage, lettuce and onions. Levels of iron and zinc were also shown to be considerably higher in spinach and cabbage than food grown using conventional farming methods. The same researchers based at the University of Newcastle published a detailed review in 2011 of the evidence to date on this topic and concluded that eating organically grown vegetables and fruit is equivalent to eating 12% more in quantity. Looking specifically at vegetables grown biodynamically, figures quoted on the Biodynamic Farming and Gardening Association in Australia from available research – though the source of this is not qualified - indicate that in comparison to more intensive farming , vitamin C content is 47% higher, magnesium is 13% higher and potassium is 8% higher. While there have been no long-term studies in relation to the health benefits of organic or biodynamically grown food in people, studies in animals fed organic food have shown them to suffer less from illness. Based on the nutrients provided, it makes sense this should be the case in people as well; both vitamin C and zinc support the immune system to fight infections. Additionally, as antioxidants, magnesium and potassium have been demonstrated to be beneficial with regards to heart health and heart disease remains the leading cause of death in the United States, this offers potential health benefits; particularly as without a health check many people do not realize there is anything wrong till they experience a heart attack. Statistics reported by the Centers for Disease Control and Prevention showed that in 2009, only 14% of adults in the US managed to consume the healthy recommendation of five portions of fruit and vegetables daily. Increasing the production of vegetables and fruit by biodynamic means would make them more widely available to allow those adults and children struggling to eat recommendations for this food group to still achieve a good intake of vitamins and minerals. It leads that plants that are healthier owing to their higher nutrient content and have been able to maximize their ability to photosynthesize thanks to the addition of fermented herbs and minerals to compost are able to generate vegetables that are more flavorsome. This is noticeable on tasting, but with regards to scientific evidence, although there is none currently that relates to vegetables, this has been studied with respect to biodynamically grown fruit. In a Californian study reported in the American Journal of Ecology and Viticulture in 2005, it was shown that grapes grown with the addition of biodynamic preparations were of ideal taste quality in comparison to those grown merely in organic conditions; this was based on the Brix score, which relates to sugar content. As a dislike of the flavor of fruit and vegetables can be cited as one of the reasons behind poor intakes, the greater availability of those with enhanced flavor can only help to increase the nation’s intake. Intensive farming may be favored by many growers for its higher yields, but there is evidence that biodynamic methods can equally produce large quantities of crops, with those that are produced of higher quality into the bargain. A German Study – albeit from 1998 - showed greater yields and higher quality fruit when apples grown using biodynamic methods were compared with other forms of cultivation. By meeting the needs of the farm from within and avoiding the need for outside inputs, biodynamic agriculture is sustainable in every way and has the potential to meet demands for produce, not just in America, but across the world. Brandt K, Leifert C, Sanderson R & Seal CJ (2011) Agroecosystem management and nutritional quality of plant foods: the case of organic fruits and vegetables. Critical Reviews in Plant Sciences. 30, 177-97. Reeve JR, Carpenter-Boggs L, Reganold JP, York AL, McGourty G & McCloskey LP (2005) Soil and winegrapes quality in biodynamically and organically managed vineyards. American Journal of Ecology and Viticulture. 56, 367-76. Balzer-Graf U, Hoppe H & Straub M (1998) Apples – organic and biodynamic. Harvest volume and vital quality in comparison. Living Earth. 49 (5) 387-97. For more information on Biodynamic farming check out the Biodynamic Farming and Gardening Association website.